The titles go backwards but not quite. As always, they end with the name of the director. The idea is cool but it happens for a reason. Detective Mike Hammer and his secretary, Velda, retreat to the Pacific Ocean to escape the nuclear explosion in a beach home. The apocalypse will send us back to where we came from, the sea. 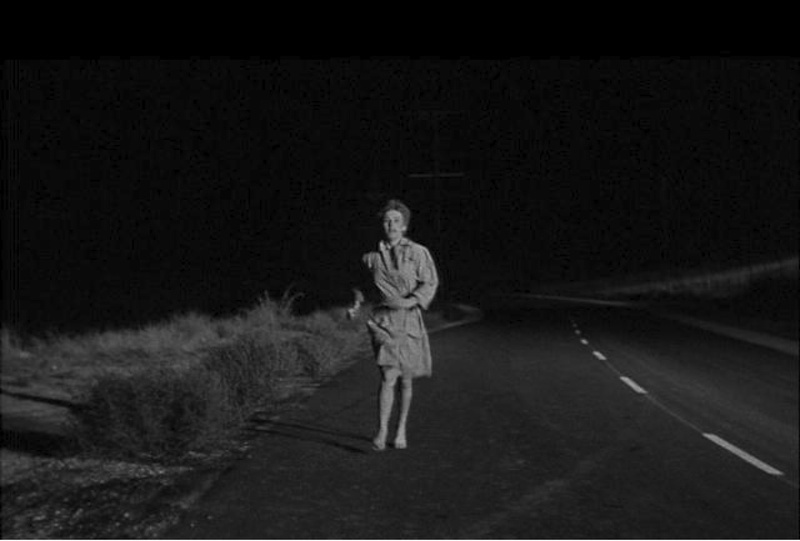 There are plenty of messages in Kiss Me Deadly. And the messages are usually reinforced through dialogue. ‘What was he so sad about? Even the title song is a jeremiad. Hammer is listening to ‘I’d Rather Have The Blues’ by Nat King Cole. The song appears again near the end of the film. By then, we realise that authentic misery is better than the synthetic comfort of technology and the surfeit of the ample that exists in the modern world. And if that does not make the audience uneasy, there is the threat of the apocalypse. When Hammer understands what is in the mysterious box, even the tough detective has to concede his impotence. Hammer had hoped to find something big, something that will make him more than penny ante money and be worthy of his strength and vitality. But, faced with ultimate technological power, Hammer understands his impotence. After that point, Hammer needs Velda, a strong woman who can help him escape plastic modernity, share his misery and make him authentic again. But to reclaim authenticity, we need to deal with the powerful and their vested interests. The audience does not observe the powerful in Kiss Me Deadly, merely the affluent lackeys – the gangsters and the police. Like the pampered at the beginning of the Marxist didactic masterpiece, Soy Cuba, the gangsters sit at the side of a luxurious pool. Women are used as objects, and the men constantly gamble, think continually about what they already have, money. The moll that Hammer meets understands rich lackeys as well as anyone. She snogs Hammer almost immediately, thinking he is different. And she is right. Hammer is narcissistic, sadistic and selfish but he is a hero. He drives fast cars, is handsome, tough and brave. He just has twentieth century baggage. Instead of being inspired by honour, he is seduced by fascist fantasy. And a society that is devoted exclusively to money is fascist. Kiss Me Deadly is preoccupied with lost masculine worth but, because it observes the modern world with a brutal eye that is honest, feminists can approve. The women in the film are either affluent but dependent on men, or obliged to live on the edge, as if in a nightmare by Kafka. Hammer finds the great whatsit but has no idea what the box contains. He merely sees it destroy. He is as clueless as K. The faceless people remain invisible. Jim Lawler is the author of Mortal Shuffle, a cracking crime novel published by Red Rattle Books on October 30th, which will be available in both paperback and Kindle. * His next novel, Hate Until Warm, will be published by Red Rattle Books in autumn 2015. *‘James Ellroy meets The Catcher In The Rye. Original, tense and violent, dark and funny.’ Crime Chronicles. Posted in Film, Film Noir, Reviews and tagged cinema, film, film noir, Hollywood, Kiss Me Deadly, movies on October 17, 2014 by Howard Jackson.